Our latest walk was held as part of March for Macritchie, a series of events organised by various groups in the nature community to raise awareness of the issues surrounding the Cross Island Line (CRL), and the wonderful wildlife that can be found in our Central Catchment Nature Reserve (CCNR). The CRL is a new MRT line that may be built under the CCNR forests, and as the soil investigation works for the project are expected to have a moderate level of impact on the ecosystem even with mitigating measures, we felt it was important that people knew about what was going on. We started off the walk with a sighting of the Green Crested Lizard (Bronchocela cristatella), which nowadays is restricted only to our forest habitats. Once widespread even in urban parkland, it has now been displaced by the introduced Changeable Lizard (Calotes versicolor). Our next herp was a male Black-bearded Flying Dragon (Draco melanopogon), which was flashing its brightly coloured dewlap! This is a form of territorial display to warn off other males, as well as attract females. With the aid of folds of skin on their body called a patagium, these amazing lizards are able to flatten their ribcages to glide from tree to tree! A number of them were scattered on the tree trunks throughout our route. Just a few minutes later, we came across a Many-lined Sun Skink (Eutropis multifasciata) splayed out on some dead wood. These beautiful lizards love to bask themselves in patches of sunlight that reach the forest floor, hence their name. We would see a couple more of them before the day was done. Stopping to take a break, our participants were treated to a storytelling session by Uncle Tony about the history of our rainforests! As the lead author of the Nature Society’s position paper on the CRL that proposed a skirting alignment that avoids passing through the CCNR, he had a wealth of knowledge to share about the value of the forests that would be affected. We were not the only visitors to the forest that morning, and a huge group of people (about 200) were also on a walk together to enjoy nature. Unfortunately, their large numbers meant that they were rather disruptive to the wildlife of the reserve, as the organisers often had to raise their voices to make themselves heard; the narrow trails, already full of people out for the weekend, were also badly overcrowded. NParks permission is required to bring in such large groups, with a maximum of 100 people within the same day. As our nature reserves already suffer from many other pressures inflicted by human activity, it is important that we follow these guidelines so as to safeguard the forests from suffering unnecessary damage. Hopefully, organisers of such events will be considerate so that everyone can enjoy our reserves. As the large group was heading for the Treetop Walk, and we found it increasingly difficult to spot wildlife because of the sheer volume of people that were in it, we had to detour to an alternative route instead. This proved to be a blessing in disguise, as we stumbled across a globally endangered adult Spiny Hill Terrapin (Heosemys spinosa)! The young of these beautiful terrestrial turtles have a heavily serrated carapace for added protection, but in adults these are greatly reduced. Found only in the lowland rainforests of Southeast Asia, they are sadly threatened by the illegal pet trade, making this find all the more special. The terrapin in question largely ignored us, ambling its way amongst our legs as it crossed the trail to move deeper into the forest. We were also fortunate to spot a Red-crowned Barbet (Psilopogon rafflesii)! Feeding on various fruits, including some figs, this stunningly colourful bird almost seemed to be showing off for our participants’ cameras! Restricted to our mature secondary and primary forests, it is a prime example of the kind of wildlife that will be affected by the CRL project. One of the most fragile habitats in the CCNR are our freshwater forest streams, pristine rivulets of water that are host to an array of fishes found nowhere else in Singapore. We were able to spot some of these such as the Saddle Barb (Systomus banksi, left) and Spanner Barb (Systomus lateristriga, right), and their predator, a Snakehead (Channa sp.). As we arrived back at the Ranger Station for a break, a Yellow Striped Tree Skink (Lipinia vittigera) was there to greet us, scurrying about on the trunk and branches of a tree. A shy creature and one of the tiniest of our skinks, it is found only in mature forests and rarely seen. Tired but exhilarated, we headed back for the exit. But the herping didn’t stop there! We met an adorable baby Clouded Monitor Lizard (Varanus nebulosus, above right) busy digging through the soil and leaf litter for food! Although we had met several of its larger cousins throughout the walk, this one won everyone’s hearts. As it rummaged about with its oversized claws while flicking its forked blue tongue, someone quipped that he could sit there watching it all day long. Our final herp of the day, sadly, was a dead Kopstein’s Bronzeback (Dendrelaphis kopsteini, left). A beautiful snake with an orange-red neck that it flares as a threat display, we suspect that it may have been killed by a human before being dumped along the roadside vegetation. Often misunderstood creatures, many snakes are persecuted and killed despite posing little threat to people. If you ever do come across one, leave it be and you’ll get along with one another just fine. If you encounter one in your house, you can always contact ACRES so that it can be relocated to somewhere safe. 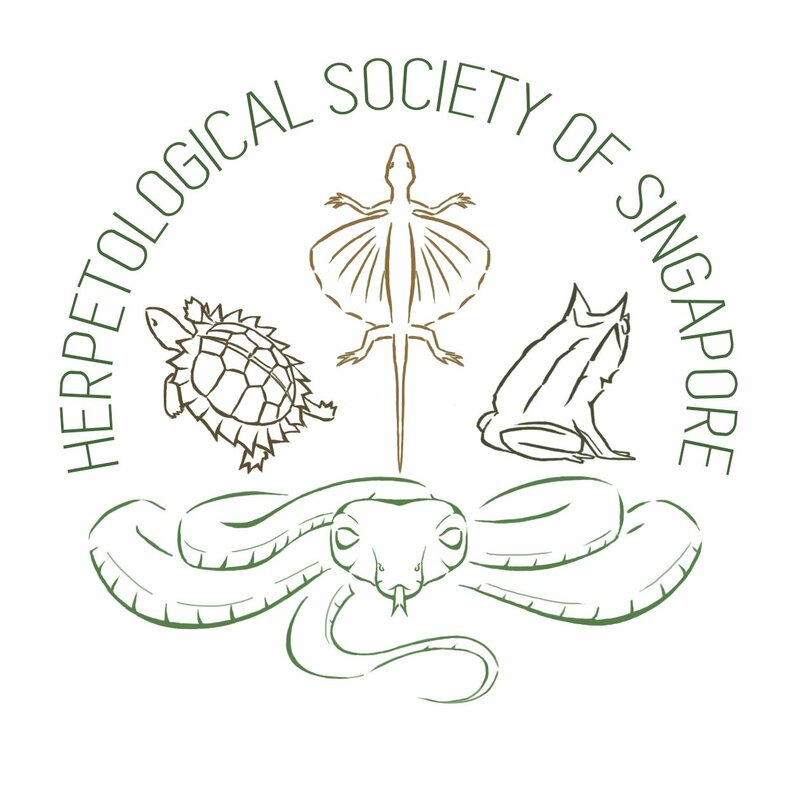 All in all, it was a wonderful walk despite the large crowds, and we hope that it inspired our participants to find out more not just about herps, but the habitat they live in and how they can do their part to protect it for future generations to enjoy!